We are excited to offer you the exclusive opportunity to purchase ‘Mildreds Vegan Cookbook’ two weeks prior to publication. The cookbook was written by Daniel Acevedo and Sarah Wasserman. This is what Daniel, our executive head chef, had to say about the new book. What was the inspiration behind writing an all vegan cookbook? Has it been more of a challenge making this cookbook vegan? No not at all, a lot of our dishes are vegan anyway and we are constantly in the kitchen working on creating new and inspiring recipes. What’s really exciting at the moment is that vegan cooking is at the forefront of innovation. Is this book just for vegans? This book is for anyone who loves food and cooking. What’s great is to see less and less of a divide between vegans, flexiarians and meat-eaters. There’s a mixture of everything from healthier options to comfort food, there’s even a few junk food recipes in there as well for those certain days when nothing else will do. Are we going to see any of our Mildreds favourites from the menu in the cookbook? We’ve included different adaptations of some classic dishes and previous dishes that have been on our menu in the past. There is even a dish that our ex-chef Gillian Snowball had on the menu when I started here as a young Chef de Partie. What are the recipes you are most excited to share with us? 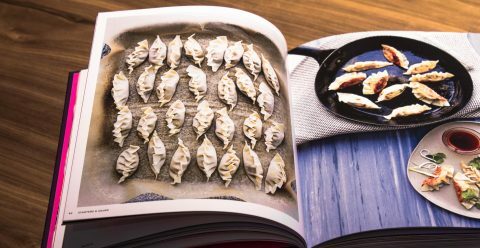 As my Mother-in-law is Polish, a recent inspiration, for me, has been experimenting with natural fermentation and adapting Polish family recipes that have been handed down from generation to generation. Follow this link to visit our shop where you can purchase our brand new book Mildreds Vegan!